You may have noticed it's still winter. At our house winter means a raging battle over our most beloved fleecy blanket. 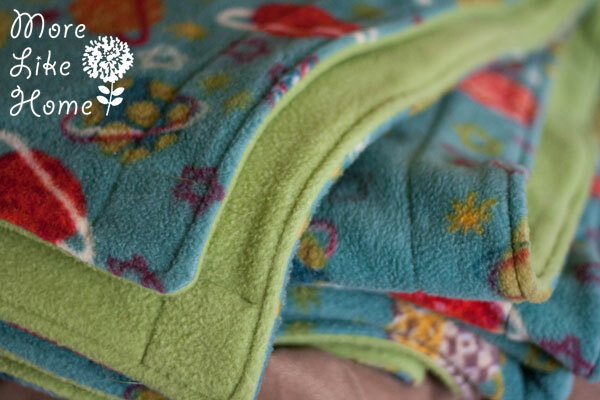 It's so cozy warm and big enough to not just cover your feet, but wrap around under them creating a pocket of warmth. We call it "the burrito effect." I made it a few years ago and, yes, it was technically a gift for Husband. But let's not get hung up on the details. All you need to know is it's a race to the couch to see who gets it (unless I'm pregnant. then I win by default.). But a few weeks ago Joann Fabric's fleece went on sale 50% and... wait for it... the sale overlapped a 25% entire purchase coupon by two days. You better believe I was there during that overlap. And so Fleecy #2 was born. Start by pre-washing and drying your fabric. 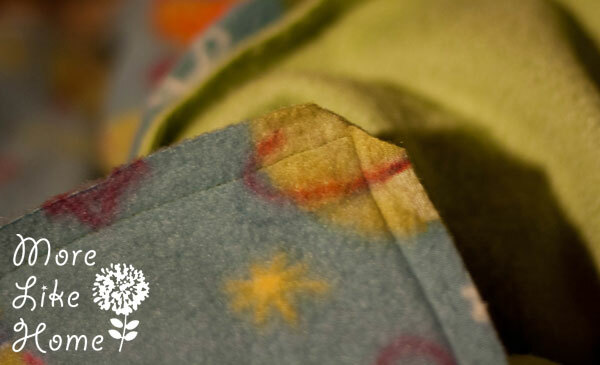 Even though fleece won't shrink, you'll want to make sure there aren't any nasty dyes or chemicals hanging on from the factory before you snuggle up with it. Cut off the selvage edges so it looks nice and tidy. Stack the pieces with right sides together and line up the edges as much as you can and trim any edges you need to get the pieces to match up perfectly - my green ended up being several inches wider and one end was cut crooked so I trimmed it down to match the printed piece. It helps to lay it out on the floor so you can make sure it's flat and lined up right. Pin around the edges. 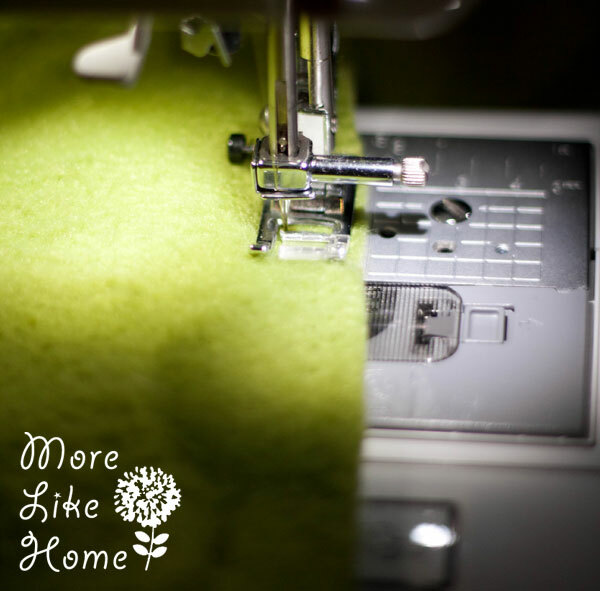 Sew around the edges with a 5/8" seam allowance, leaving an 8 - 10" opening for turning. Flip it right side out and push the corners out nice and square. Lay it out flat on the floor again to make sure it's all lined up right. Tuck in the fabric at the opening and pin it closed. Pin all around the edges, and put several pins across the center of the blanket to keep the layers from shifting while you work. Topstitch all around the the outside of the blanket with a 1/4" seam allowance. Then go around again with a 2" or so seam allowance - I just followed the edge of the ruler on my sewing machine. And that's it! Snuggle up and wait for spring! With the sale and coupon it still cost about $22 to make this blanket. So fleece isn't very cheap... but it was definitely cheaper than the $55+ it would have cost full price. 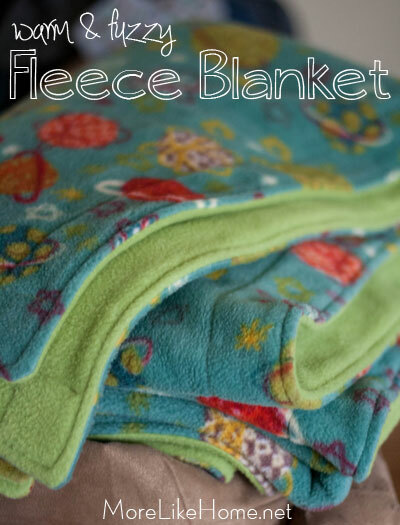 And I was able to make it much bigger and thicker than the cheap little throw blankets from the store! Now our household lives in harmony once again. Although you should probably know these are actually big enough to fit two people... unless you turn it into a highly competitive game. 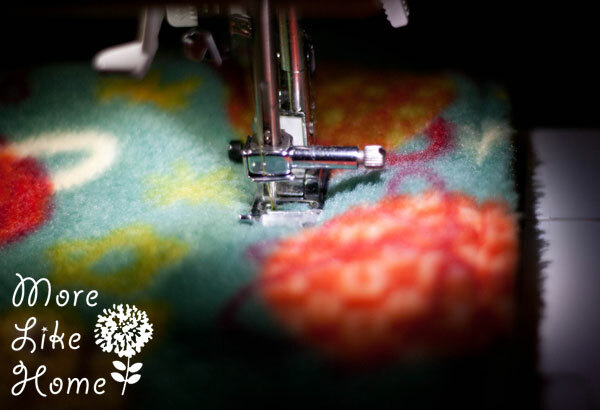 ;) If you're feeling a little chilly there are probably some good fleece sales coming up with spring on the horizon, so keep your eyes open and make yourself a nice fleecy blanket... or two! So excited to find this link on Pinterest.. Exactly what I'm looking for to make and send to my hubby overseas! I also bind mine with fleece it makes a nice edge and I just cut across the width to make the binding. Cute in a different color. Oh, that's a great idea! 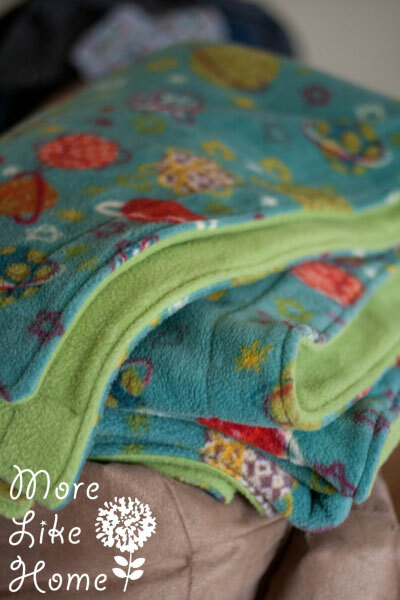 Do you do double layer fleece for the blanket or a single layer? Georgia - Do you have any pointers for adding some quilting lines on an adult size blanket? I did some on a baby blanket many years ago, but this is so much bigger. 1. Use squiggly free-form "lines" so there's no pressure to get them straight. 2. Use a printed fabric with striped or a repeating pattern you can follow to keep you lines straight. 3. Use a yard stick and fabric marker to mark the lines before you begin (this is the best way if you want really straight lines). 4. 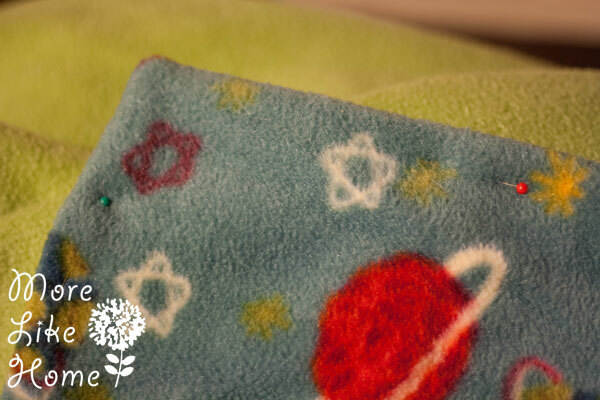 No matter which method you choose, put lots of pins across the entire blanket before you start sewing to help prevent the layers from slipping. I forgot to reply to yours. Thank you for all the pointers. My daughter was very pleased. I decided to do 2 quilt lines evenly spaced. It was easier to do them straight because the print side had a pattern of blocks through the out so I was able to follow the lines with ease. I look forward to making more blankets like this so I'll keep all your pointers in mind, especially when I don't have a print side with lines for a guide. I did one of these for my son-in-law in Denver Broncos fleece. It was my first one and it turned out great and he loved it. That's great, and I'm glad he liked it! I just made another one for a Christmas gift, too. I've had this pinned for a few years. 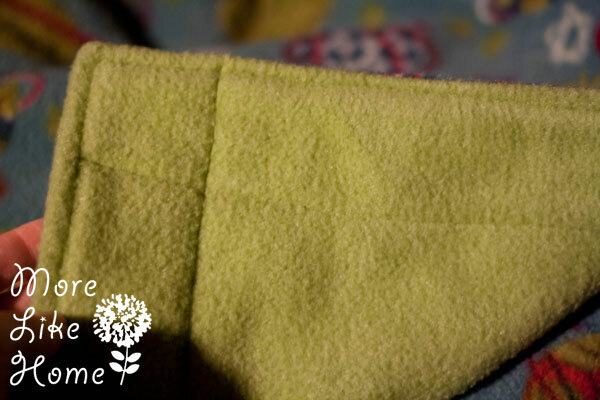 I have made sewn fleece blankets before, but I like the added detail of the extra 2" border. My daughter and I are making some blankets for our local children's hospital using this pattern. We are always checking the remnant bin at Joanns for fleece that we could use. We stocked up on 1 yd pieces and that will make 2 infant/toddler sized blankets. Thanks for posting! I took full advantage of Joann's after Thanksgiving 70% off on fleece and got enough to make 5 blankets! One for me and gifts for the rest. Starting tomorrow.